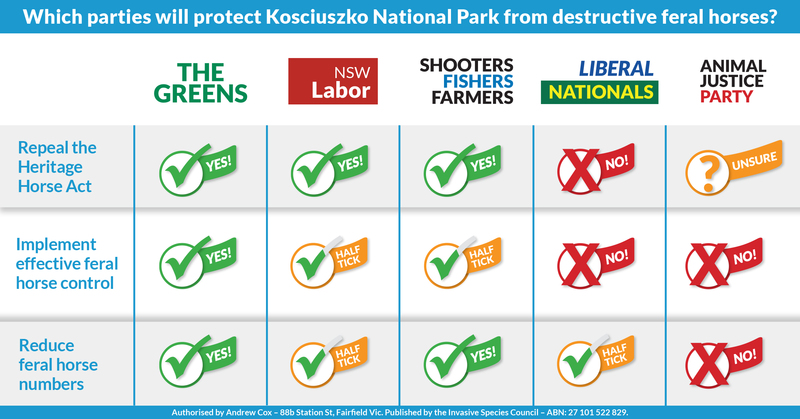 Which parties will protect Kosciuszko National Park from destructive feral horses? We’ve contacted each of the major parties to find out if they will stand up for Kosciuszko National Park by overturning the decision to protect feral horses in one of Australia’s most iconic national parks, or let feral horses continue to wreak havoc on this precious park. Feral horses destroy fragile alpine habitats, ruin waterways and threaten native wildlife. They belong in a paddock not Kosciuszko National Park. The Greens will repeal the law that protects destructive feral horses, repair feral horse damage and implement all humane, effective control options. The Shooters, Fishers & Farmers will repeal the law that protects destructive feral horses and implement humane, effective control. Labor will repeal the law that protects destructive feral horses and repair feral horse damage. The Liberal/National coalition created and will retain the law that protects destructive feral horses with no effective control. The Animal Justice Party will retain the law that protects destructive feral horses and offers no effective control.